Local District 8 supports the learning communities of Banning, Carson, Gardena, Narbonne, San Pedro, and Washington Complex Schools. Map of Local District 8 here. "Our Charge is to fundamentally improve the interaction between the teacher and the student to create critical thinkers prepared to participate in a diverse and complex society." "Our Mission is to provide high quality instruction and coherent, rigorous curriculum in every classroom to facilitate student learning and achievement." Welcome to Local District 8's new website. Local 8 Is Now "Educational Service Center - South"
Los Angeles Unified School District's "Local District 8" is now part of the Educational Service Center - South. Please go here to view the Educational Service Center - South homepage. This site remains open for archive purposes. It will not be updated as of July 2012. Wun "The Shot" Versher Promotes Fitness and Healthy Living!!! Wun "The Shot" Versher visited 186th Street School on Monday, June 4th, and spoke to the 4th and 5th grade students about healthy living. 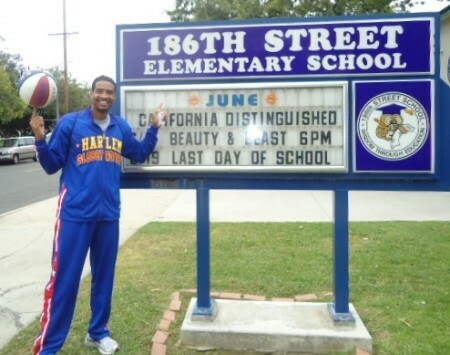 He shared the Harlem Globetrotters S.P.I.N.™ (Some Playtime Is Necessary) Program. This program is designed to make fitness fun and to help kids lead an active lifestyle. Wun told the Wise Owls to make sure they get out and play at least 15 minutes a day. He taught a few students some of the Globetrotters' basketball tricks. It was a fun-filled time for students and teachers. Wun is a native of Compton, CA, and he and some of his teammates will be coming to Carson, CA to teach social and teamwork skills at the Carson 24-Hour Fitness Center on June 25th and 26th. We salute an outstanding ambassador for fitness!!! 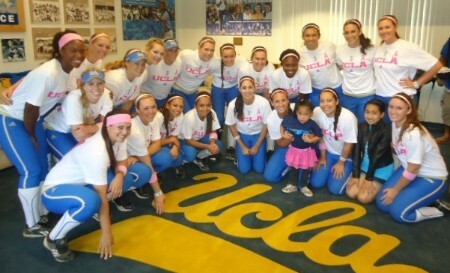 Miah Murphy-Escala, a Kindergarten student at 186th Street School, was adopted by the UCLA Softball Team on Saturday, April 21st, at Easton Stadium in Westwood, CA. Head Coach Kelly Inouye-Perez welcomed Miah into the Bruin Family and introduced her to all of her Bruin sisters before their Pac 12 softball game against Utah. The little Owl Champion, who wasn't expected to live beyond nine months, is now six years old, and succeeding against all odds. Coach Inouye-Perez, her staff, and all of the team saluted Miah for having a heart and will of a champion. As Coach Inouye-Perez stated, "She's a fighter!" Miah was a little shy in meeting the Bruins, but with her mom and sister, Taylor, by her side, Miah accepted the Bruin attention. The introduction was love at first sight. The girls cheered for Miah before the game, and Miah cheered for them during the game. Miah's parents, Principal Reed, and Assistant Principal EIS Kanemitsu all agreed, spending time with the Bruin Softball Team was a touching, heartfelt, and endearing experience of love. 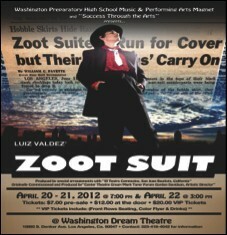 Zoot Suit by Luis Valdez is one of those unique theater pieces that educates as much as it entertains. The play is based on real events that occurred in Los Angeles during World War II. It shined a spotlight on the racially motived attacks that terrorized the barrios of East Los Angeles. The Zoot suit became a symbol of defiance and honor for the young, Latino men of the period. This is a unique opportunity for Washington Prep to showcase some amazing young Latino actors. The cast of twenty is lead by Javier Barbosa and Henry Palacios. Henry is a newcomer to the stage but has developed a remarkable version of the iconic El Pachuco. He shares the stage with Javier Barbosa who won best actor in the state of California at the fall Theatre Festival. Together they will hold the complete attention of the audience. Zoot Suit is truly a unique piece. Directed by Dr. Melanie Andrews, Band Director, Mr. Reggie Andrews, Music Director, Mr. Anthony Llorens, Lightening Director, Mr.Rob Fritz and Set Design by Mr. John Ong. A remarkable cast and crew! We hope you enjoy it! 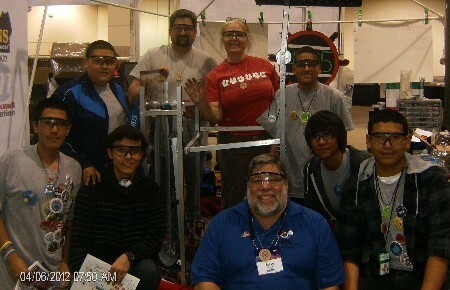 When: April 20, 21 @ 7:00 p.m. April 22 @ 3:00 p.m.
Banning HS Robotics Team Competes in Las Vegas and Meets the Woz! FIRST Team 4345, representing Banning High School, went to Las Vegas for the Robotics competition. It was very exciting and very challenging. We learned a lot from our experience. In the competition we had improved our robot from the previous competition. We had to because our robot did not function how we wanted it. In Long Beach we placed 53 out of 67 teams. This time we placed 14 out of 42. At the first competition we had a robot that we struggled to get working properly, but we overcame that obstacle in the second competition. We had lots of help from the other teams whenever we needed it and also got and lent supplies. FIRST’s motto of gracious professionalism and coopertition were felt all throughout the event. We met with other teams and talked about our plans about what we would do once on the playing field. We shared our strengths and weaknesses in an effort to build strong alliances. One of the judges was Steve Wozniak, co-founder of Apple, and he went around to different teams to see what they had accomplished. Mr. Wozniak spent a lot of time in our pit and told us how much he thought our robot was ingenious and so different from everyone else’s robot. We took pictures with him and got some of our swag autographed by him. Team 4345 will always remember this great experience of going to Las Vegas and competing. Thank you Mr. Lopez and Mr. Romero for all you did to get our team there. It truly was an experience of a lifetime. 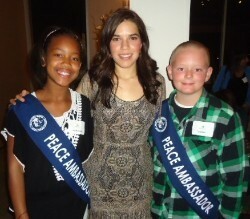 186th Street School Principal, Marcia Reed, and two of her 5th grade students, Sariah Ricketts and Tyler Handa, were invited to spend the evening with Eric Dawson, the Peace First President and America Ferrera, the National Spokesperson for Peace First. The evening was hosted by Tal Gilad, the Executive Director of Peace First Los Angeles. Tal facilitated a conversation about promoting Peace First, a violence prevention program in all schools, and ways to implement a peace centered curriculum in schools around the world. America is a proud product of LAUSD. She attended El Camino Real High School, and she taught the Peace First curriculum in 3rd and 4th grade classes at Norwood Elementary School while attending USC. Forty elementary schools in the Los Angeles Unified School District (LAUSD), four from Local District 8, have been honored as 2012 California Distinguished Schools by the state Department of Education. This award recognizes exemplary instructional programs and academic excellence. The four Local District 8 elementary schools are: 186th Street; Chapman Avenue; Denker Avenue; South Shores Magnet School for the Visual and Performing Arts. “These elementary schools are among the best of the best in the Los Angeles Unified School District,” Superintendent John Deasy said. “Their outstanding academic success is a tribute to hard- working students, involved parents, excellent teachers and stellar principals. “I would like to congratulate and thank the entire staff and school family at these outstanding campuses, the pride of LAUSD,” he added. The California School Recognition Program, now in its 26th year, honors the state’s most exemplary and inspiring public schools. Elementary and secondary schools are recognized in alternate years. Eligibility for the 2012 designation was based on the Academic Performance Index, as well as Adequate Yearly Progress, which charts improvement by subgroups such as family income; ethnicity and language of origin. Students in every group must demonstrate substantial growth. Winning schools also must narrow the gap between high-and-low achievers. 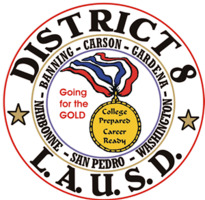 Congratulations to the San Pedro High School Academic Decathlon team members who shined in the California STATE Academic Decathlon in Sacramento this past week! They exemplify the slogan of San Pedro High School "Home of Scholars and Champions!"